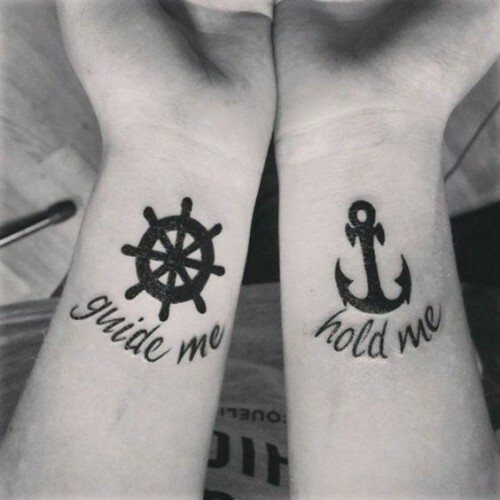 A “guide me”/”hold me” tattoo with a compass and anchor tattoo is just what you need to strengthen the adoration you and your loved one have for each other. Have the signs inked on your wrist, and whenever you look at it, you’ll be reminded that there’s someone in your life who truly cares about you. 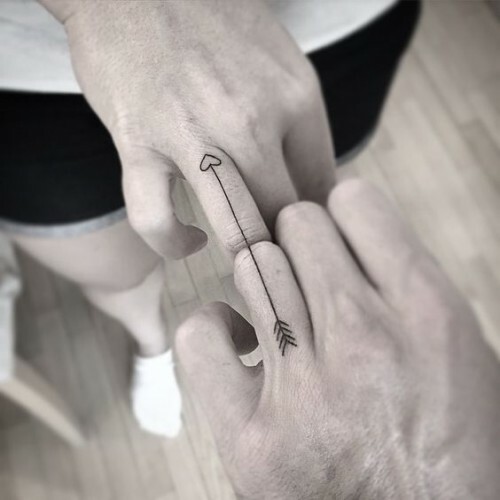 A bow and arrow couples’ tattoo looks sleek and discreet. For couples, it could mean that you’re made for each other. Choose a simple design that perfectly portrays the strong bond you two share. Have it anywhere on your body, although on the side of your hand looks the best. 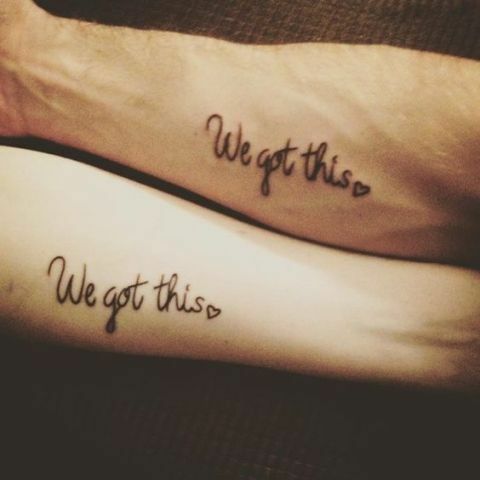 “We got this” and a matching heart is a perfect tattoo for couples who know that love is hard. But whatever happens, you have each other. No matter how tough things might get along the way, you’ll be there for your loved one to ensure them that everything will be alright. The perfect tattoo is sometimes the simplest. 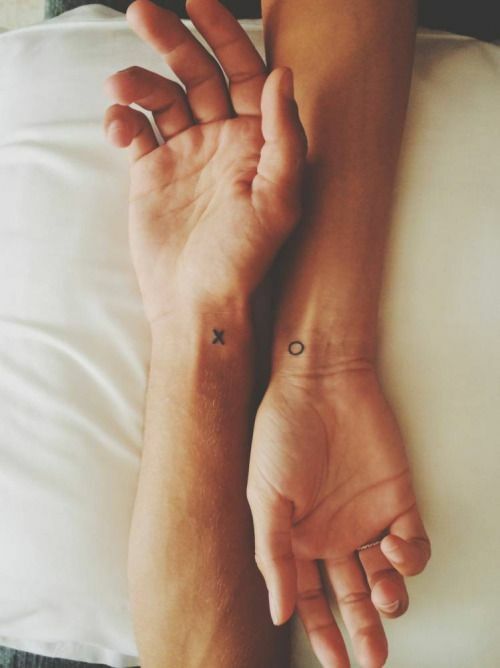 An X and O couples tattoo on the wrist looks adorable. It is made for couples who just want something to remind them of their better half. Our whole existence is a sequence of Xs and Os. Make yours stand out! Be the queen of his heart, and let him be the king of yours. Be proud of your relationship, and let the whole world see it. 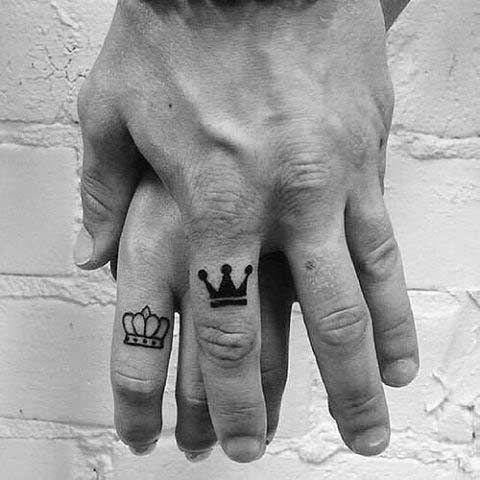 A King and Queen couples’ tattoo with two separate crowns for him and her look adorable anywhere on your body. However, somehow on the wrist, it’s more obvious and alluring. The love you hold for your better half is eternal, artistic, and complicated. 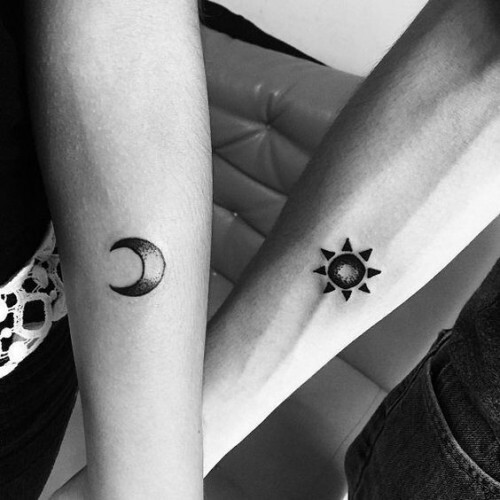 A sun and moon tattoo conveys that you can’t live without one another. Decide on the most interesting design, and make your tattoo stand above the crowd. Put your imagination to good use and come up with your very own design. 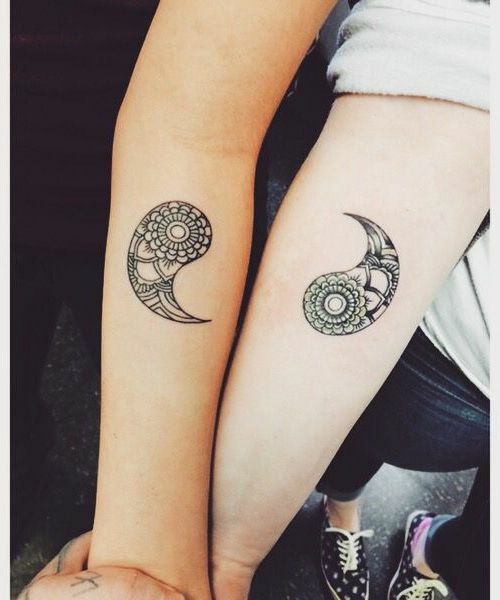 A blended Yin and Yang tattoo looks absolutely incredible on the upper arm. If you’re looking for inspiration, this is it. The matching couples tattoo clearly lays out that you’re made for each other, and that you’ll always find a way to make things work, no matter how difficult life gets along the way. Fingerprints are unique. Get his on your wrist, and have him get yours on his. 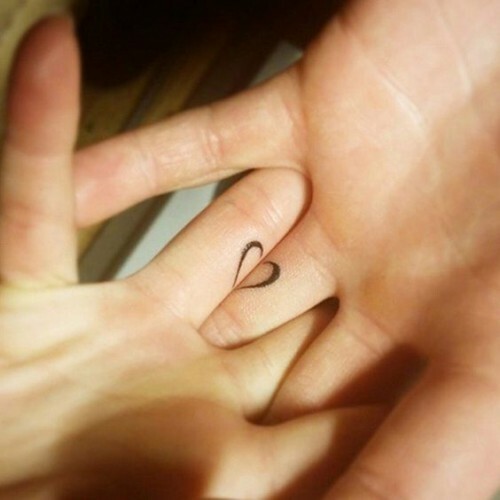 Wrap it nicely in a heart tattoo and complement it with the forever sign. It’s perfect for couples who truly believe that the love that they share is for eternity. 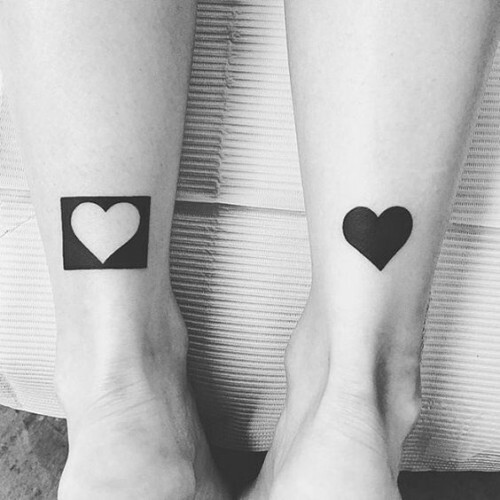 Minimalistic tattoos are in trend this season. 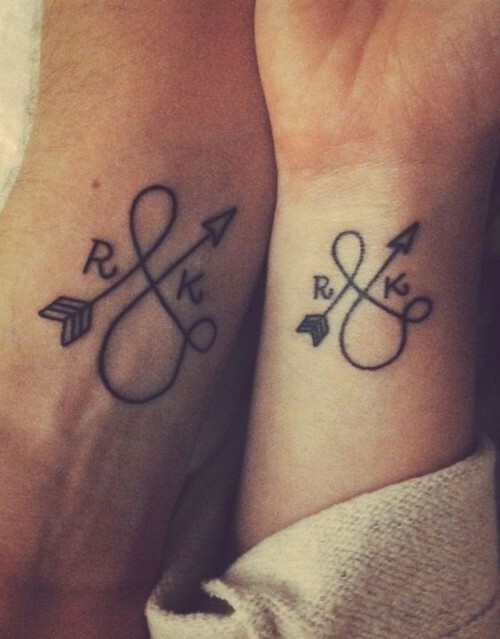 A bracelet-inspired couples tattoo – a thicker model for him and thinner for her – looks genuine, interesting and sleek. 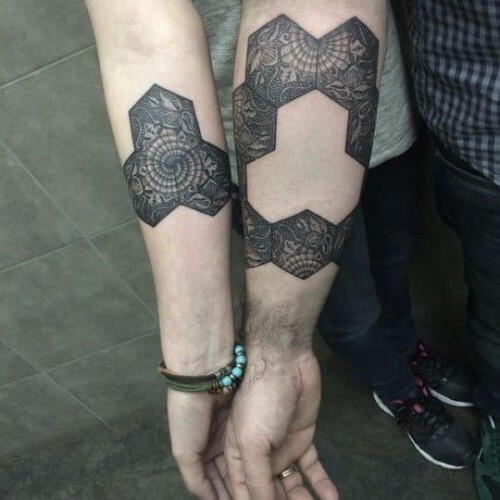 We love the symmetry and geometric allure the tattoo exudes. It’s definitely a unique idea you might want to consider. A heartbeat-inspired tattoo exudes pure love and adoration. 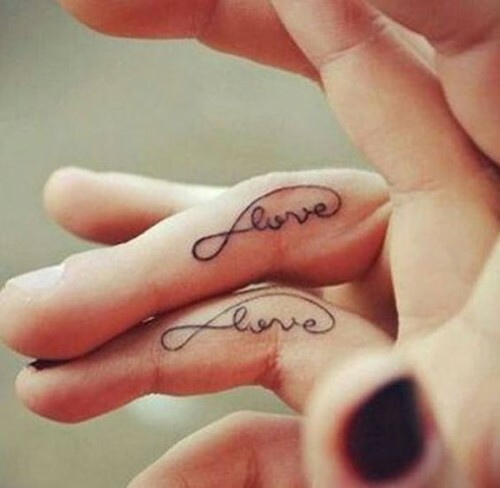 We love the simplicity of the design, and the way these two tattoos match each other when the couple joins their hands. How much do you trust your loved one to get something like this inked on your hand? 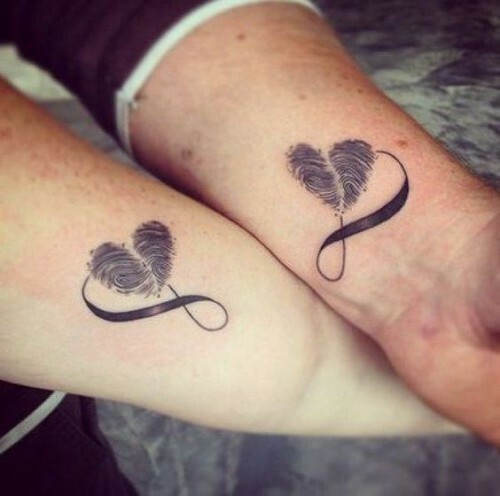 A plain “love” message tattoo for him and her is just what you need to showcase the true feelings that you have for one another. It’s inspiring and intimate because it is meant just for the two of you. 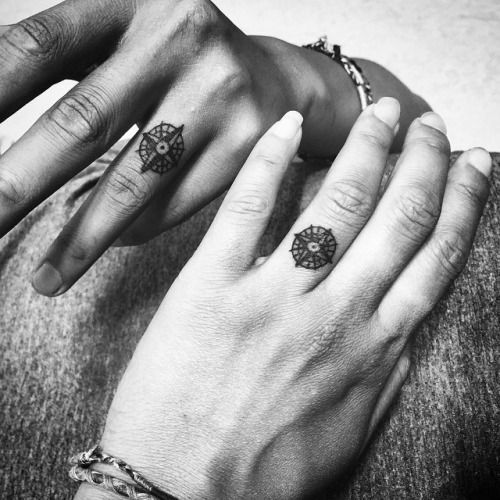 Looking for the perfect tattoo to replace the conventional wedding ring? 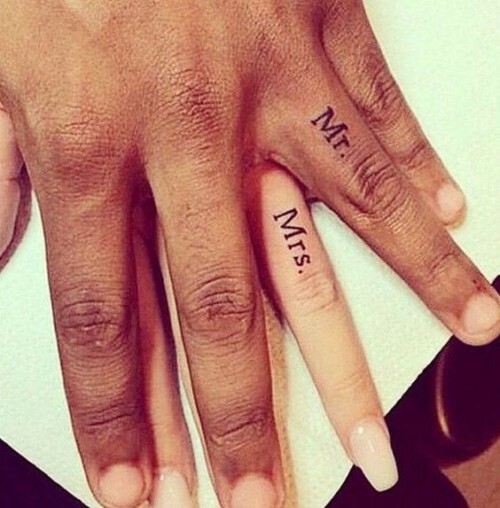 Look no further and choose this cool “Mr./Mrs.” tattoo. It’s a very ingenious idea, especially because you can’t really lose a tattoo. It will be with you forever to remind you that you’ve found the one. 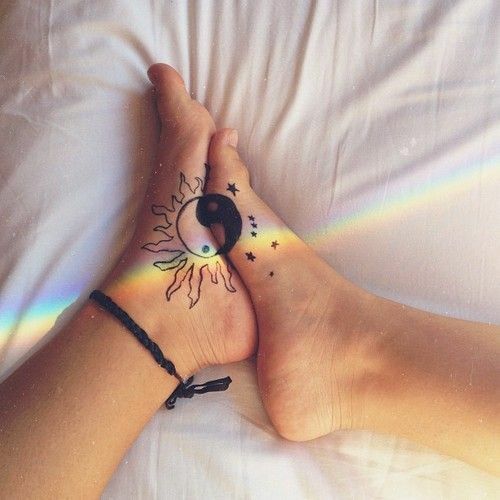 A blend between the famous yin & yang, and sun & moon tattoo inked on your foot, and matching your loved one is the coolest idea ever. A match made in heaven! The perfect love message imprinted on both your arm and the arm of your loved one. 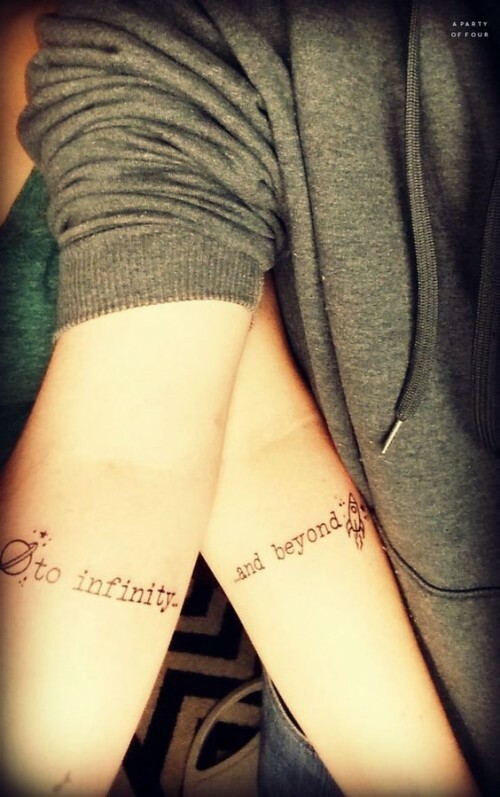 “To infinity” for you, “and beyond” for him exude sheer adoration. It is the kind of message that will be with you forever. 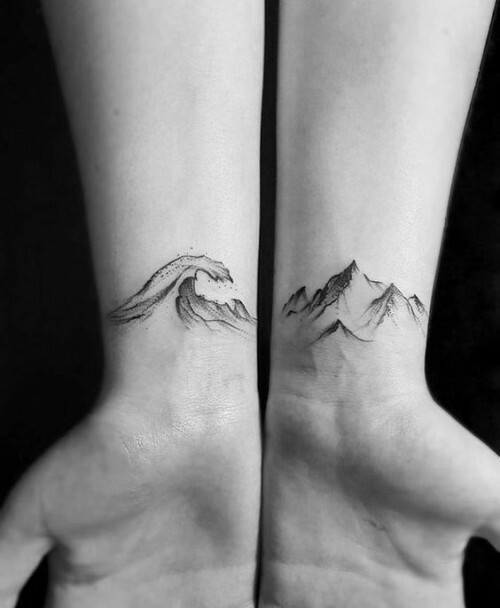 This adorable mountain and sea matching tattoo is absolutely adorable. It is extremely well-made and realistic. Be the sea and let your loved one be the mountain. You know what they say about contrast – they can be a match made in heaven. Dot art has gotten a lot of attention lately in the tattoo industry. 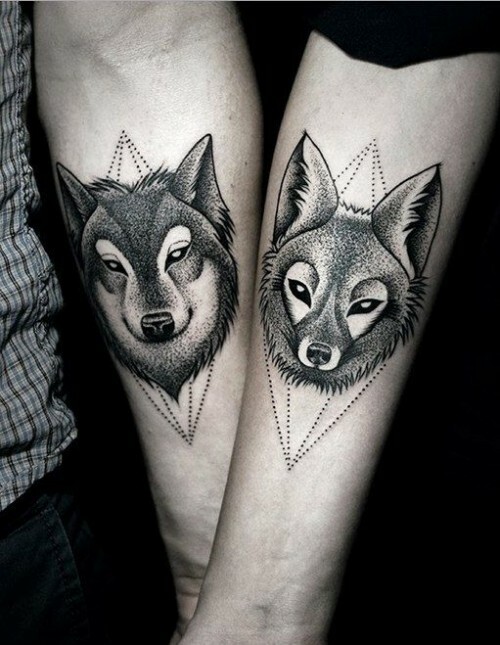 This pair of wolves for him and her looks stunning. The drawing is marvelous, and it will beautifully complement your wild personality. They say we need wings to fly. 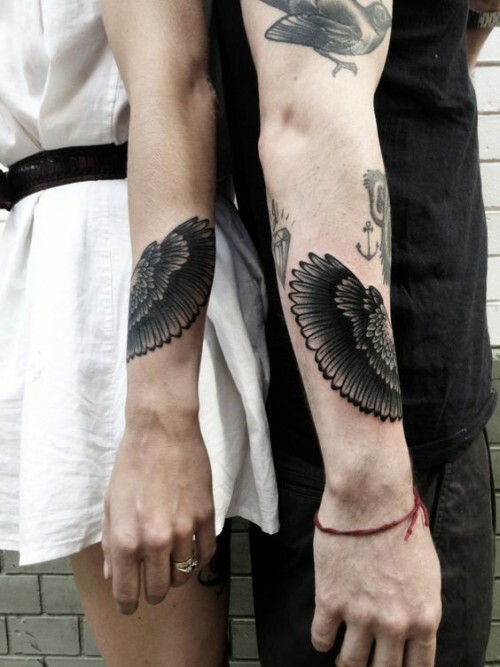 A wings-inspired tattoo for you and your better half is just what you need to feel close to his heart. The art behind the above tattoos is fascinating. We truly love the artistic allure of the design. An anchor inspired tattoo on the side of your palm is all the proof that you need to truly feel your loved one close to your heart. 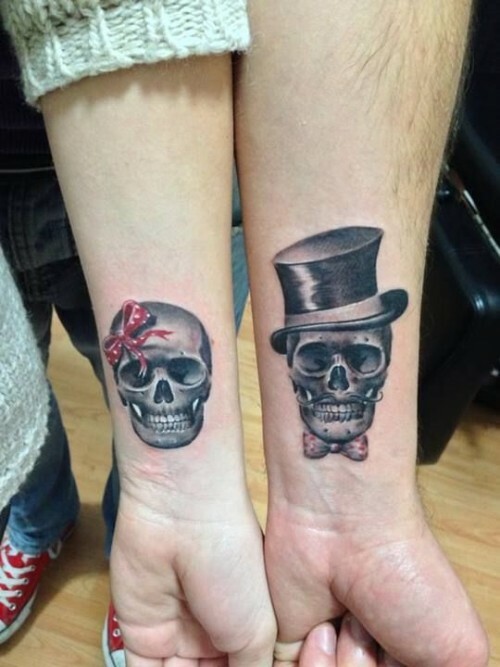 Every time you look at the tattoo, you’ll be reminded that your better half has a tattoo just like yours. It’s a union and a commitment you’ll cherish for a lifetime. 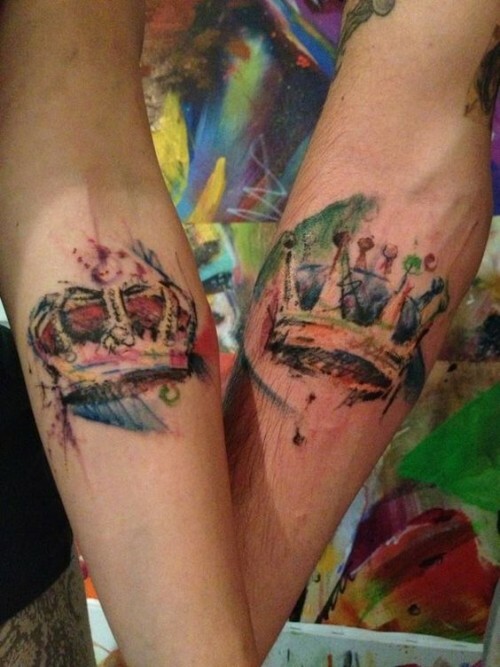 A king & queen inspired tattoo can be another great idea for a couples’ tattoo. Ink it on one of your finger – preferably the ring finger – so that you can always remember how much your loved one means to you. The tattoo idea is one of the most unconventional, but somehow it works perfectly. How’s got the key to your heart? 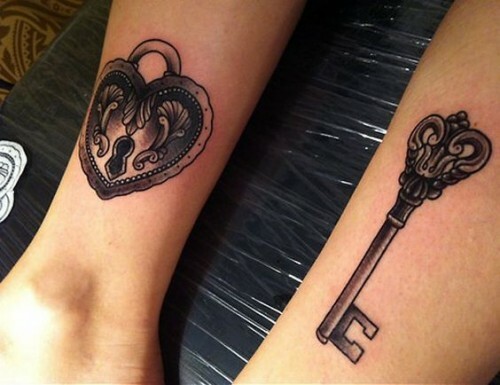 Heat a heart and key matching tattoo and express the bond you have in the most original way possible. Get it on your leg or arm, it doesn’t really matter as long as the message is obvious. In love with Disney? 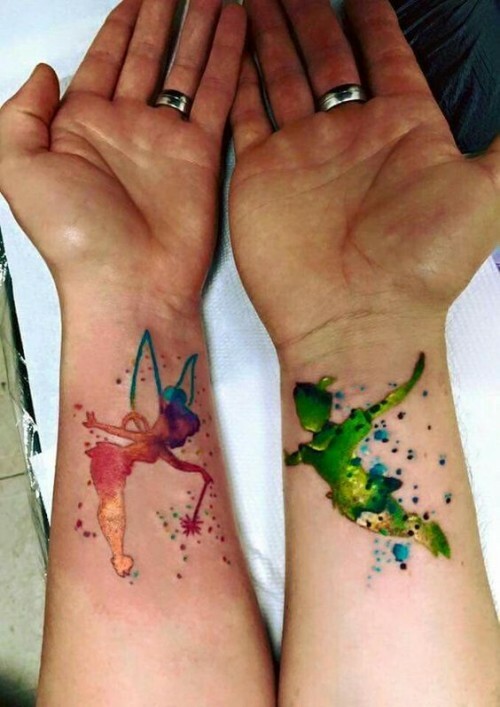 Now you can make your passion part of your love story with a colorful and fun tattoo idea. Use the color blend that you like the most and dare to be different. Be that bubbly, happy couple all the time. Forever in love! 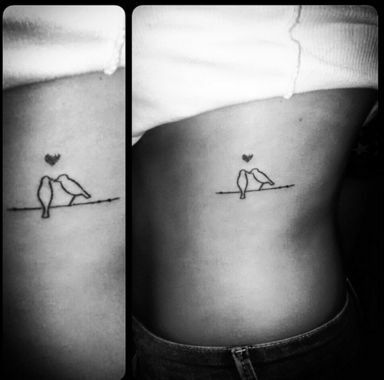 Love birds matching tattoos somewhere only you and your better half can see it is the perfect proof that you’re meant to be together for better and for worse. What more can you wish for? 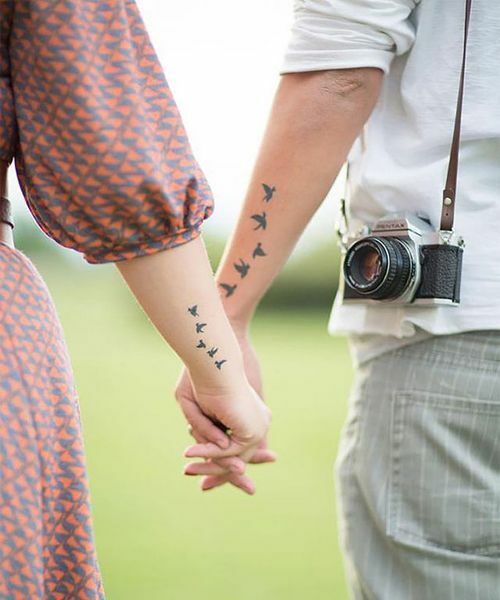 Fly away together to the moon and back with this birds-inspired matching tattoo for couples. 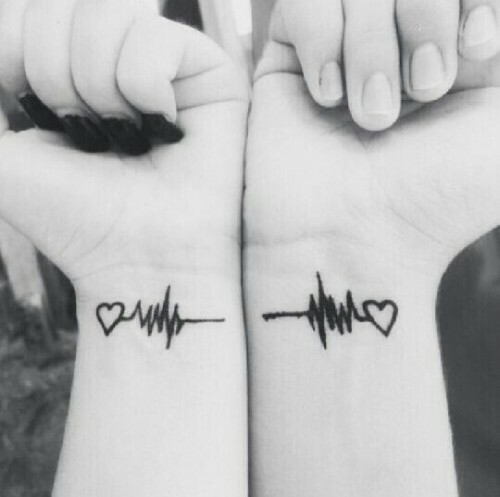 Get them inked on the side of your hand so that you can remember how strong the connection you two share is. Sometimes you need a very powerful symbol to remind you that you can overcome all challenges together with your loved one. 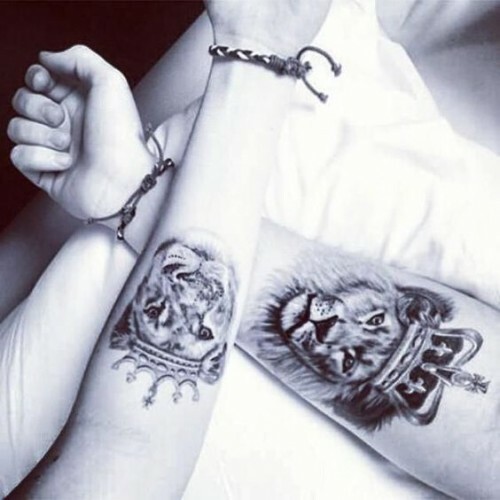 The perfect tattoo – a lion for him & lioness for you. Because you’re wild, and your love is passionate and it can survive everything in the real world, which is almost like an untamed jungle. 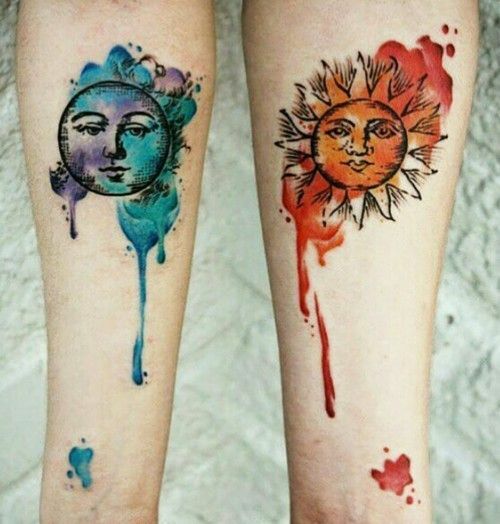 Watercolor tattoos are in trend these days. They’re really cool and minimalistic. Choose imperfect shapes because no relationship is perfect, and put your imagination to good use. He’s your king for all eternity, and you’re his beloved queen. 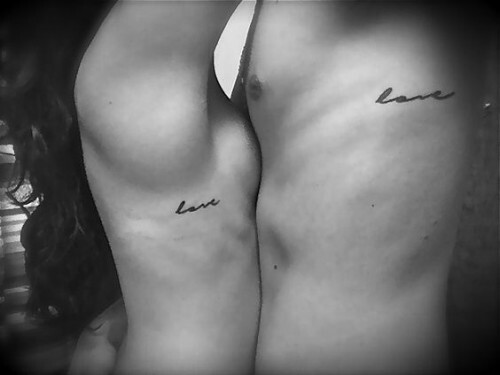 Cherish each other in a tattoo. The most impressive tattoos are sometimes the simplest. 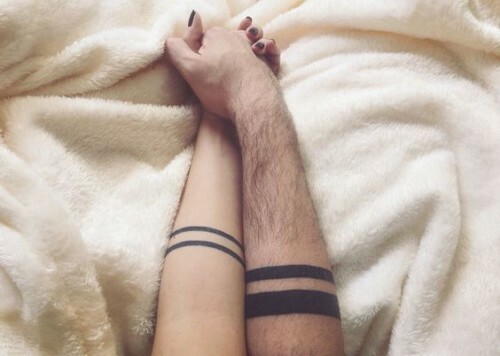 An empty square tattoo for you, and full square tattoo for him is a clear sign that you need each other, and that you can only feel complete when you’re together. Your love is square, honest and limitless. A real relationship can only be a complete relationship when there are no lies involved. 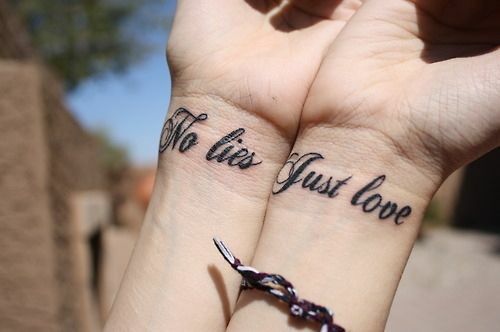 A “no lies – just love” tattoo can be a daily reminder that you have the most honest and truthful bond. He’ll never disappoint and he’ll understand you. Sometimes the simplest tattoo means more than a thousand words. Identical star tattoos will never go out of style. 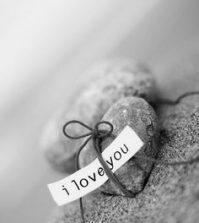 Every time you look at it, you’ll be reminded that your heart belongs to someone really special in your life. He’s understanding and he’ll always think of you whenever he look at that tattoo. You’re the one for him, even though you’ve got the simplest design. 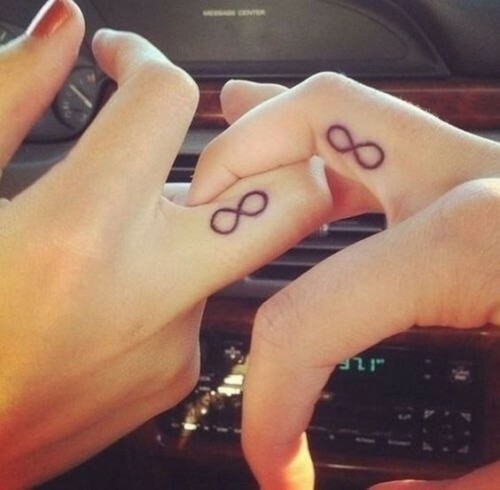 Forever together – that’s the plain meaning of a forever sign tattoo. 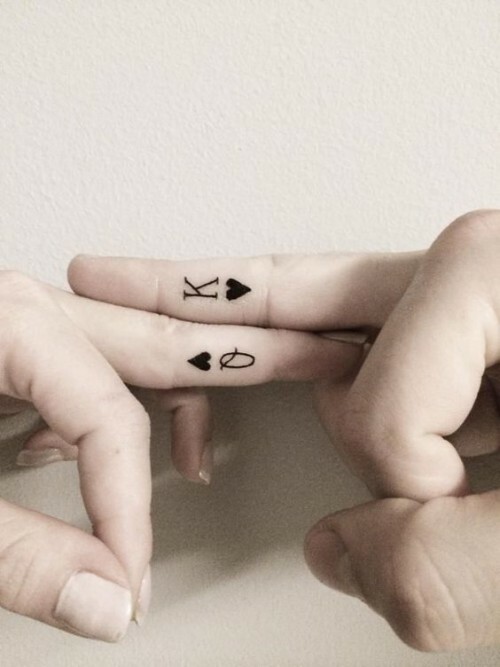 Have it inked on one of your fingers, and you’ll never forget about your better half, no matter how tough things might get in the relationship. The idea is a classic one, but the message conveyed doesn’t really need any further explanation. Choose a love message that perfectly portrays how strong your bond is, and then decide on a font. You can even handwrite the message to personalize your tattoo and make it stand out. All that he is, is all that you’ll ever need, right? Choose the font that best inspire you both. Together you have wings to fly and overcome all challenges. Get a single wing and have him get the other. When your hands combine you’ll be together and ready to conquer the world. In the middle, make a heart. 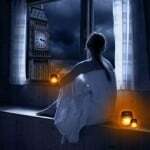 Keep one half, because without him your soul and body are not complete. Opt for the most original design to tie your bond and make the relationship even stronger. 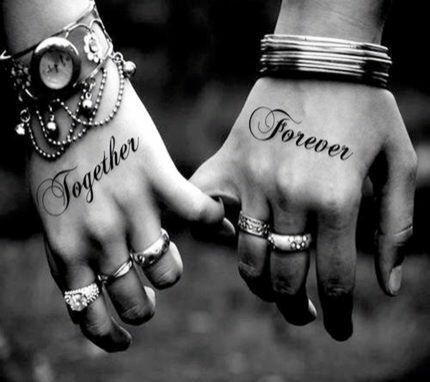 A forever/together tattoo on the back of your hand might seem like a bold tattoo. But if you’re 100% sure that you’re meant for each other, why not? Forever together, right? Make it count and choose this bold and artistic design that doesn’t need any further explanation. The whole world would seem incomplete without the sun and the moon. Just like your relationship – without each other, you are incomplete. Stick to the simplest design, and make it work. It’s such a minimalistic idea that really conveys originality. Choose the symbol that fits best with your personality. 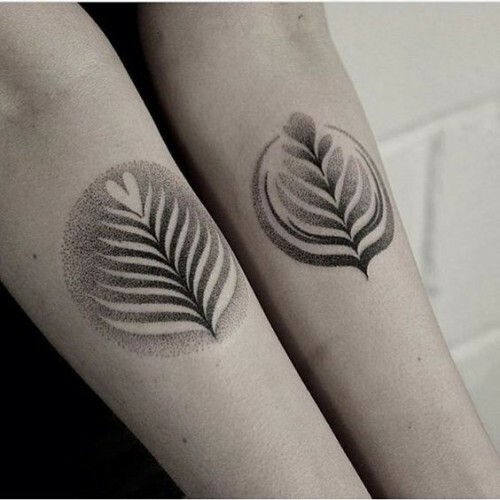 Dot art is the latest trend in tattoo design. It’s also a very inspiring trend especially when you get a delicate, very alluring tattoo. Make it like a puzzle-like tattoo to remind you that you’re meant for each other every day of your life. Floral tattoos, or any other design works, as long as it appeals to your senses. 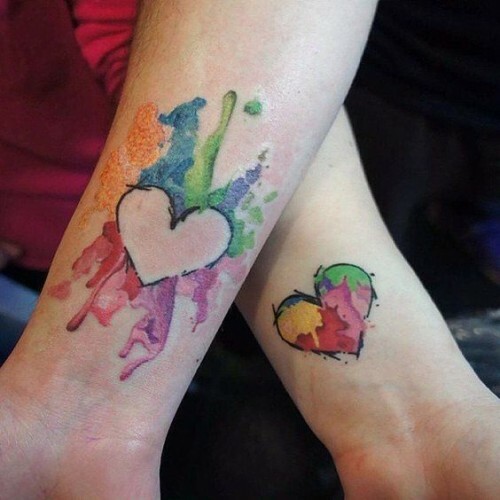 A watercolor tattoo with an empty and full heart is the best puzzle-like tattoo that you can get. Choose the color blend that you love the best and dare to do things differently to mark the love bond you two share. At a first glimpse, the design looks incomplete. But the trend is really hot right now, and we know for sure that it will prevail years from now on. An inspiring tattoo idea in plain black exudes sheer originality. 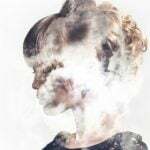 Basically, it conveys that you’re incomplete without him and that you would do anything to make things work, no matter how challenging things might get along the way. Have the tattoo inked right above the ankle, on your leg to feel that he truly lifts your spirit when you’re down. Tinkerbell is Peter Pan’s match made is heaven. The idea can work for you and your loved one too. You can always adapt it to make your style and personality. We love the artistic vibe that goes with the tattoo – it’s magical and it is perfect for couples who fancy fantasy movies and fiction books. Graphic tattoos are the most difficult to ink. But the above design is simply breathtaking. We love the puzzle effect too. It conveys completion and pure adoration. Go for an oversize and handle the pain – at the end of the day, no pain no game. right? 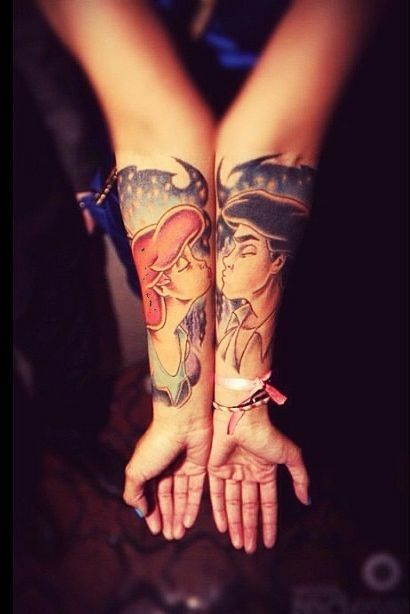 A very creative and colorful idea for a couples tattoo. But somehow, it works and it looks incredibly original. Customize the idea, and make yours different to have a unique matching tattoo that strengthens the bond you share. Red and blue are royal colors that go really well together. Let him be blue like the sky, and get the red. You’re fire! Without him you’re lost and you feel incomplete – that the plain message of a half heart tattoo. But when you’re together everything fits perfectly, and whatever happens, you can overcome when you’re together. Have your half heart on your inside palm, right on the finger. When you join hands the heart will be complete, and will your soul. 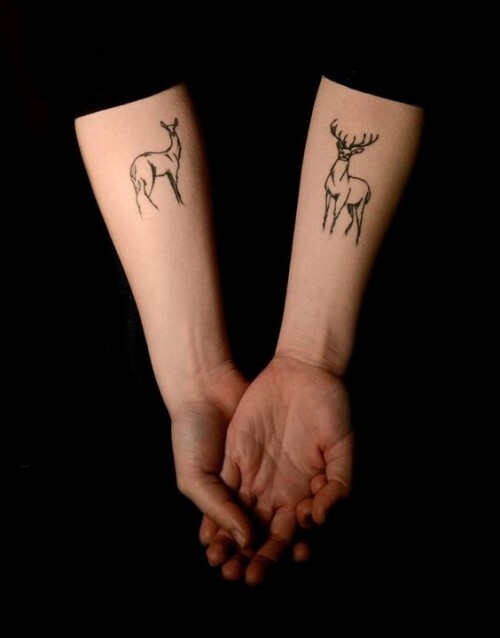 A buck deer and doe matching tattoo on your forearm is very powerful. Both of you are wild, but you want to be wild together and live your life to the fullest sharing the best adventures. Wild animals inked somewhere on your body have a very strong effect, especially when those animals are noble and statuesque. It’s simple – you’re his queen and he’s your king. 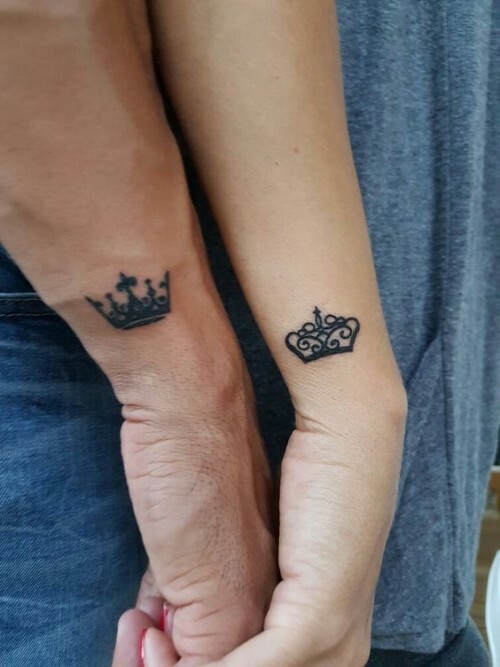 You mean the world to each other, so why no seal the deal with a bold crown tattoo? Choose a simplistic, but powerful design and let them speak. Have them in plain sight for the whole world to see. A tattoo idea for the cold hearted. But it’s a good one because it states that you want to grow old together, and live your life as a strong couple for all eternity and beyond. Choose a design that inspires you and settle on the one that best appeals to your sense and personality. Guide and support him no matter what and let him hold you at your toughest times. 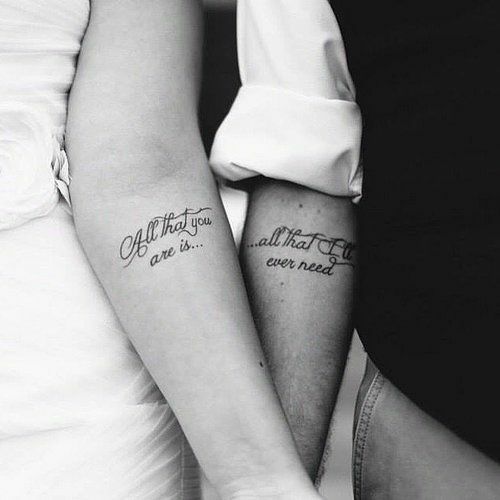 Together you can do it all, and this tattoo idea is living proof that nothing is impossible when love paves the way. Be strong but do it together! Yours and his initials separated by the forever sign is all you need to feel him close to your heart no matter where you are. Don’t let distance or anything else ruin the love you hold for each other, and work your way to building a strong and fruitful relationship. When you have love, everything can happen. Life happens when you’re happy and confident that the person standing right next to you will never disappoint you. Get inked with a simple love tattoo and your feelings will last forever, both on your body and in your heart. Wedding rings are overrated. Why not get a tattoo instead? Have it inked on your ring finger, and choose a design that inspires you the most. 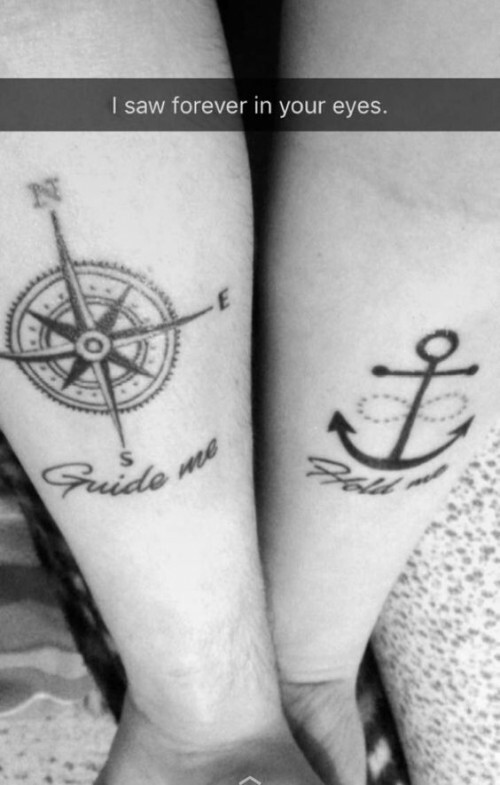 A compass inspired tattoo idea conveys that no matter where you are and how far you go, your better half will be there with you and for you. It’s such a cool and romantic approach! 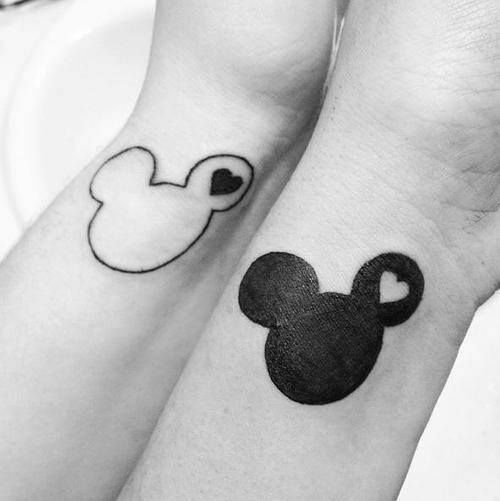 A black Mickey and transparent Minnie Mouse is the kind of tattoo for couples who love Disney characters and movies. It’s a fun idea, but it has the most powerful message – that you belong with your better half, and that without one another you are incomplete. Have inked wherever you want, and be proud: you have the best companion by your side who will never let you down. A matching arrows tattoo split in half doesn’t really need any further explanation. When you join fingers, you’re one; you are complete. A very chic and minimalistic idea that only couples who truly love each other can understand. Feel free to customize it how you see fit, and you’ll never feel alone; even when he’s not by your side. What goes around comes around, and because life is a continuous circle, this idea of a tattoo exudes eternity. Get two – one thicker for him and one thinner for you. This way you’ll be together always and forever. 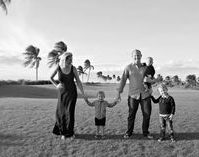 Keep it simple and the end result will knock your socks off. Ink it on your leg or arm, and let it be a reminder that together you’re indestructible. Relationships are tough. Only the strongest, most confident and honest couples can survive. 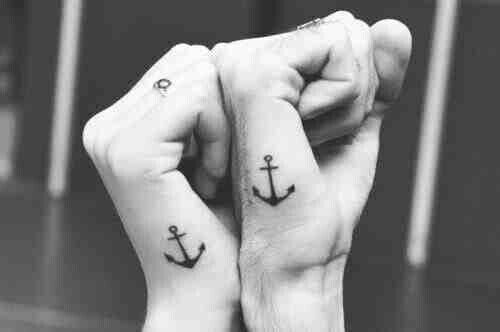 Tattoos are like marriage; but marriage for the soul. Before you get one, you have to be sure that he or she is the one. Stick with designs that inspire you; designs that conveys love and adoration. They really don’t have to be that complex. As long as you know what it means, it should be enough. 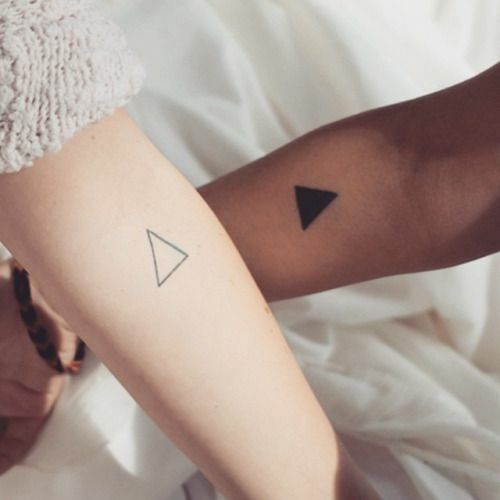 Which of the 50 couples tattoos we mentioned best inspires you? 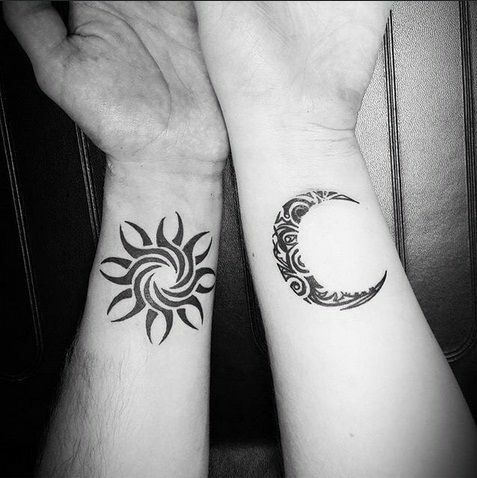 Would you get a matching tattoo with your loved one? I need advice. I need to pursue my crush. If you want to nourish a relationship with your crush, then spend additional time with that person. There is a way for you to share your feelings with that person. Speak with your crush about your thoughts and feelings. The best option is to be direct and honest. Have a great day, Amber! Thank you for sharing your positive comment. Have a great day, Sophia! Thank you for sharing your positive comment. Have a great day, Spider!